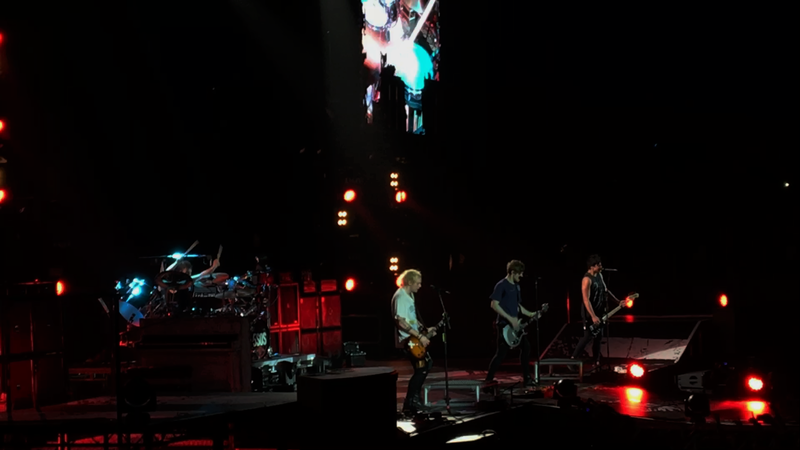 Last Friday night I finally saw 5SOS live. I’ve been following them for quite a few years now but, despite having met them in their 2014 signing in Barcelona (when they were here to open for 1D), I had never seen them live. So you can imagine how excited I was to see them, even if I went alone (my friends were in other parts of the arena). I had a seat in the stands so I didn’t bother to go queue early. I arrived 1h prior to the doors opening time. I started queuing alone but then a friend and her friend joined me and we stayed together until it was time to find our seats. Sadly, they were two blocks to my right. After a while of being there all alone on my phone, a friend from uni told me she had just seen me. So I looked around until I saw her and then I went where she was so we could talk for a while and then I went back to my seat. After a bit more of waiting, the opening band came on stage. Unfortunately, they weren’t Don Broco (they had been opening for 5SOS on previous shows). They were a Spanish band that I didn’t know, they didn’t sound that bad but I didn’t understand a thing they were singing...I didn’t pay much attention to them, though. I was just waiting for 5SOS to get on stage. May I say, though, the music that played before they started playing was so damn good: Blink 182, Sum 41, Green Day and many other great bands/artists. The lights went down and 5SOS started playing.The first song was Carry On, one of my favourites. Beautiful lyrics and beautiful performance. I was already so glad that I had gone, even if I was alone. Although it took me 4 more songs – Hey Everybody, Money, Voodoo Doll and Don’t Stop – to be comfortable enough to let go and properly have fun. They also played Disconnected and Long Way Home which are two of my favourite “old” songs. During Outer Space, we witnessed one of the most especial moments of the show. 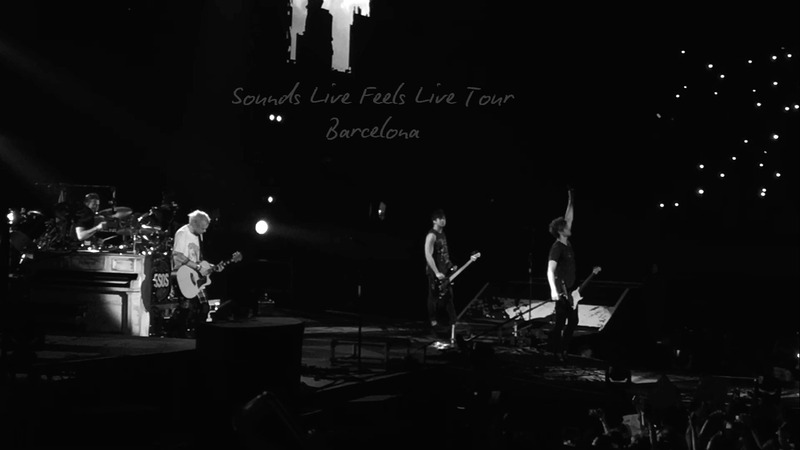 As you know, more often than not there are projects created by the fans to show to the band in their concerts. In this case, during this song, there was a European project. Each country held signs with a star that had the flag of the country; so, obviously, we had the Spanish one. I just think it’s amazing that a whole continent comes together for something that always turns out to be pretty magical. The second project was during Vapor, before that they had played Waste The Night. This one was the Spanish project and each part of the venue did a different thing. 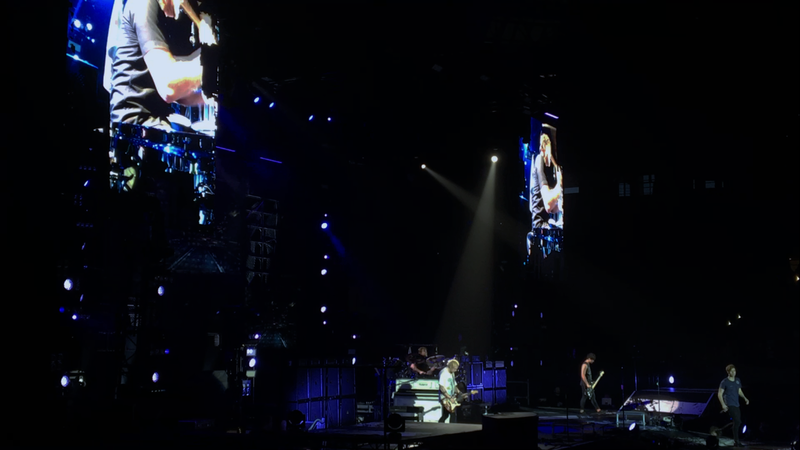 People in the stands had to turn on the flashlight on their phones, people in the pit had to lift a paper with the silhouettes of the boys, and people that had floor seats had to create a mosaic of The New Broken Scene logo (broken heart with a safety pin) with the cardstocks they’d find on their seats. Again, I think this is a beautiful project because the safety pin means the union between them and the fans through music. They also decided to test their Spanish. It was funny, Calum knew how to say ‘Hi my name is Calum and I’m Australian’. And well, also Calum and Luke, knew how to ask for drinks lol. But, I think it was Michael that said this (could be wrong), they did Spanish in school but they didn’t pay much attention because they never would've thought they’d come to Spain. As if that didn’t go from funny to emotional in minutes, Amnesia was next. I almost cried. It was yet another beautiful moment. 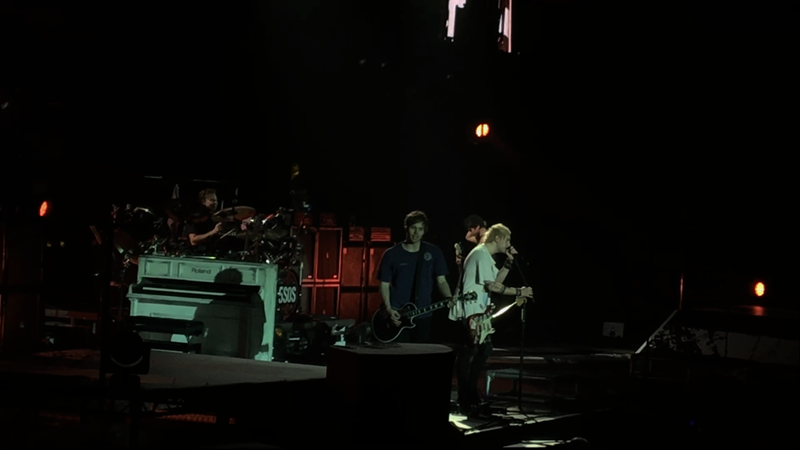 After Amnesia, they played Castaway which isn’t a slow song, at all. So I was there jumping around and THEN they played Jet Black Heart. Another heartfelt song. Emotional rollercoaster anyone? When they play this song live it starts just with Michael and his guitar on stage. He started singing a few sets of ‘woah’ and asking us to imitate him. Then he stopped for what felt like forever. Looking at him standing there in complete silence contemplating the crowd made me tear up. I just couldn’t help it anymore. Finally, he started singing and when he got to the chorus he just let us sing the whole thing. When the other guys jumped back on stage and there was more light you could see the third project, the world project. This one consisted in holding papers that you had to print and they already had the words ‘I AM’ written on them, fans just had to write whatever they wanted on them and hold the paper up during the song. Again, beautiful I know I’ve said beautiful a lot in this post but I have no other words to describe it. Then they played four songs that are more like energetic/have fun/jump around and sing along kind of songs. First, it was End Up Here, one of my favourites from their first album; not just because Ashton sings in it, not at all... After Good Girls, Ashton did a drum solo and let me tell you that was pretty damn good. AMAZING. Also, I forgot to say this earlier but Michael, Luke, and Calum all had instrumental solos in different songs and they killed it. They’re all so good at what they do. I already knew it but seeing it and hearing it live is way different than through a phone screen. 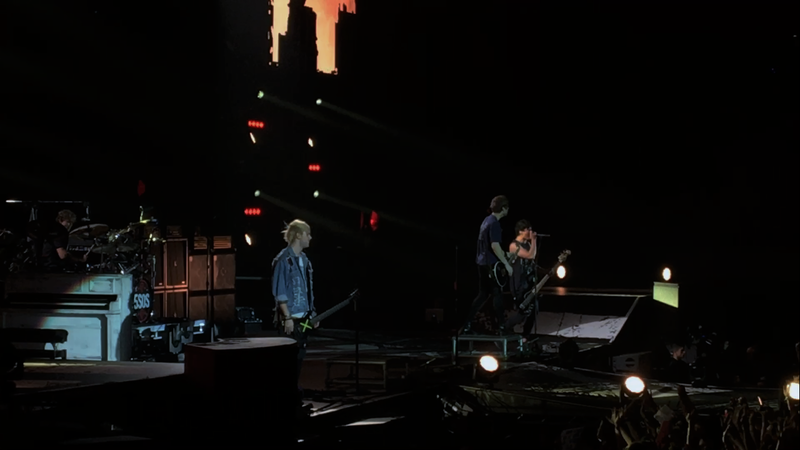 Right before they went backstage they sang Permanent Vacation and What I Like About You. Both are fun to jump and dance along to as well. 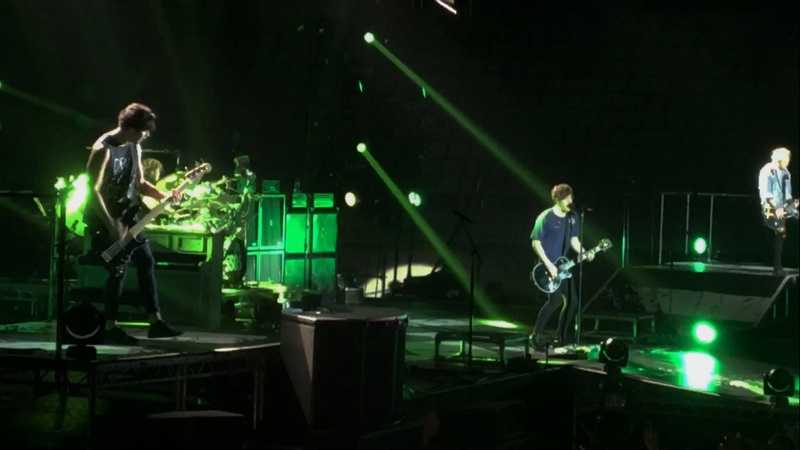 The guys went backstage but returned to end the show with She’s Kinda Hot and She Looks So Perfect. 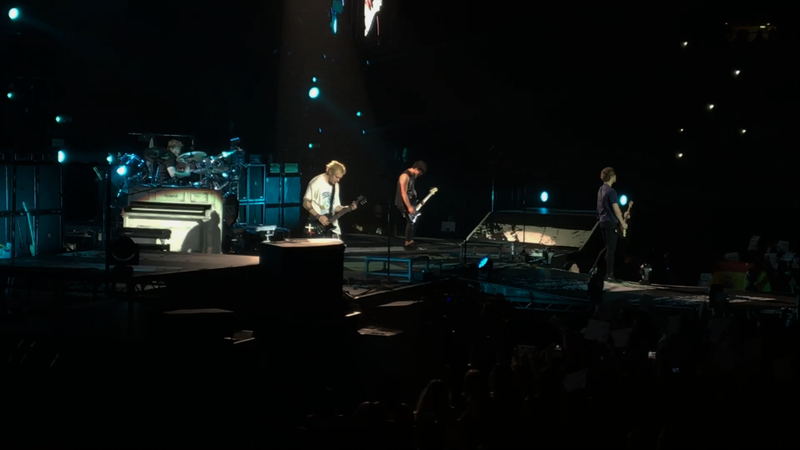 Once they finished playing them Ashton and Calum changed instruments: Ash played the bass and Cal played the drums. Then they all said goodbye and it was all over. Time flies when you’re having fun. I will miss that night. 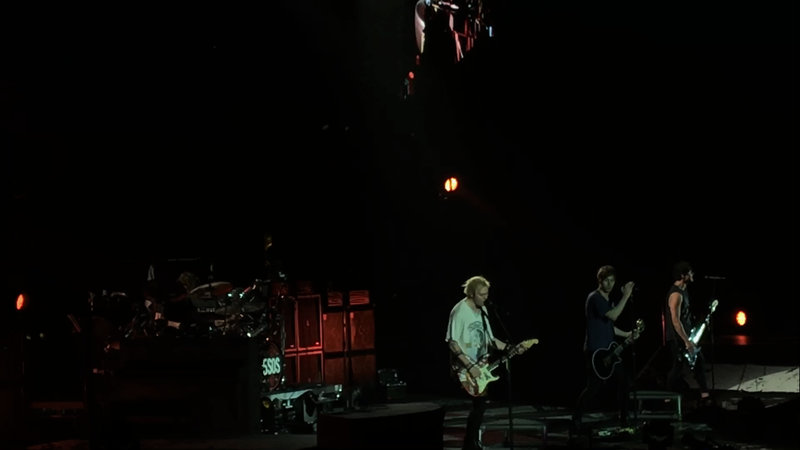 This was the first time I saw 5SOS live but it definitely won’t be the last one, there are many songs from them I want to hear live. After years of following them, I finally got to see them and I couldn’t be any happier. (It’s funny how I met them before seeing them play live lol). The only sad thing is that I don’t have any more concerts to look forward to this year and if you’ve been reading my posts, you know concerts have been the highlight of every month this year for me. They’re like my happy place. If you’re still reading this thank you, I know it was really long. Basically, if you have to take something from this I’d tell you to go to a show even if you don’t have anyone to go with. There are so many great artists/bands I have not seen live just because I was afraid of going alone to their concert. Now I know I can still have fun and so can you. So please, go see your favourite artists no matter what, it will brighten up your day, or even your week/month. Have you ever seen 5SOS live? Have you ever been alone to a concert? Soooo happy to read that you finally saw them live and had so much fun! You deserve it, love. Aw thank you so much, Carmen!